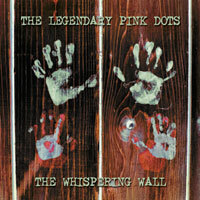 The Legendary Pink Dots, "The Whispering Wall"
Recorded at Studio Lent and Studio Klaverland, January-March 2004. Klymyzh Plazhda... Sing While You May. The Whispering Wall is the Legendary Pink Dots' latest album & third release on ROIR. The album will coincide with a 35-date North American tour. The Pink Dots know that the future, our man-made future is coming. And it is coming to get us. Whereas 2002's All The King's Men relied heavily on lush weighty soundscapes, The Whispering Wall provides Ka-Spel's poetry more room to flourish. Prophetic lyrics & haunting vocals envelope the listener; each song a continuation of the on-going story the LPD tell-- either through whimsical songs about Humpty Dumpty's travails or frightful anecdotes about a society increasingly dependent on technology yet perilously incapable of doing without it. Please take a listen-- it may be the most intriguing story you've heard in a very long time-- until next time. For the last 25 years, the Legendary Pink Dots have been one of the most consistently innovative and intriguing bands around. Constantly touring on the Continent and in North America, they have produced over 25 records on labels such as Play It Again Sam, Wax Trax, Staalplaat, Caroline, and Soleilmoon USA. Their leader, Edward Ka-Spel, a frequent collaborator with Skinny Puppy, has released albums of his own material and with Tear Garden (members of Skinny Puppy). Their unusual mixture of psychedelic whimsy, industrial gloom, and Alice In Wonderland textural madness has made them a constant presence on the innovative fringes of the cult music scene. Their dedication to the road and their inimitable style has earned them a near universal respect from critics and peers.